Stanbridge College students, staff, and faculty raised funds to donate toys and gifts to over 50 pediatric sub-acute patients from Foothill Regional Medical Center and Whittier Hospital Medical Center in Orange County. The gifts, delivered by Santa Claus and representatives from Stanbridge College student organizations, included specially designed toys to aid children and young adults with physical and developmental challenges and injuries. 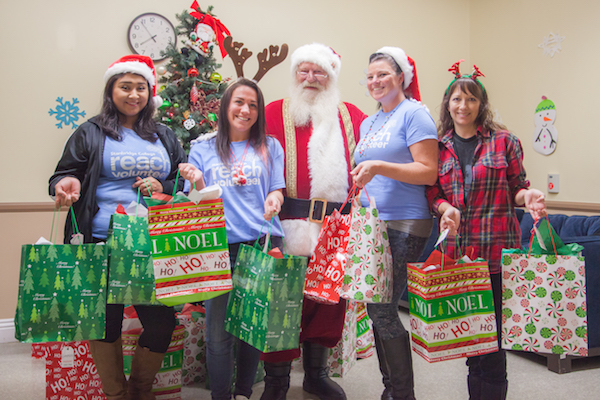 Prior to delivery, Stanbridge student volunteers worked together to wrap the gifts, giving each child special treats from Santa. Among action hero figures, animated movies, and princess dolls were gifts to help the children with therapeutic treatments including sensory toys, weighted blankets, musical instruments, CD players with headphones, body massagers, and stress balls. These items are specifically chosen for patients with developmental disabilities, prematurity, birth abnormalities, congenital diseases, spinal cord and head injuries, and other illnesses and injuries that limit them from receiving care at home. Stanbridge College’s award-winning REACH – Beyond the Classroom™ Civic Engagement and Service Learning Initiative, has partnered with local non-profits to serve the needs of local and global communities. In the past five years, students, staff, and faculty have donated fresh meals, clothing, school supplies, and toys to homeless and low-income families in Orange County. Earlier this year, Stanbridge College was named to the 2015 President’s Higher Education Community Service Honor Roll by the Corporation for National and Community Service for the seventh consecutive year. The award is the highest federal recognition a college or university can receive in recognition of its commitment to service-learning and civic engagement. To learn more about the programs at Stanbridge College and its community service initiative, please visit www.stanbridge.edu.